K.S. Design Group, Inc. is a premier landscaping company specializing in design, implementing and maintaining unique and creative landscaping projects. Our staff manages all types of landscaping projects from the simple to the sublime. We pride ourselves on getting to know each of our clients and designing a system and package that meet their needs. Whether you are in the market for residential or light commercial services, K.S. Design Group, Inc. has the knowledge, experience and resources to meet your needs. Our services are available throughout the northern suburbs of Illinois including; Yorkville, Oswego, Naperville, Winfield, Glen Ellyn, Wheaton and surrounding areas. With over 20 years of industry experience as a landscape design company, K.S. Design Group, Inc. is able to offer a variety of materials in various textures and colors in order to provide a unique and pleasing design. Regardless of the size and scope of the project, we are able to do it all. Lower blades to 2-2 1/2″ for the last lawn cut of the season to prevent winter lawn disease problems and protect new growth. The professional team at K.S. 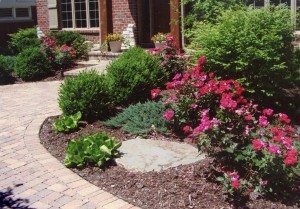 Design Group, Inc. encourage you to contact our team directly at, 630-553-1773 with any questions regarding our landscaping services. We look forward to working with you soon. Serving Yorkville, Oswego, Naperville, Winfield, Glen Ellyn, Wheaton and surrounding areas of Illinois.